The triumph of SYRIZA may unleash a political domino effect in Europe. 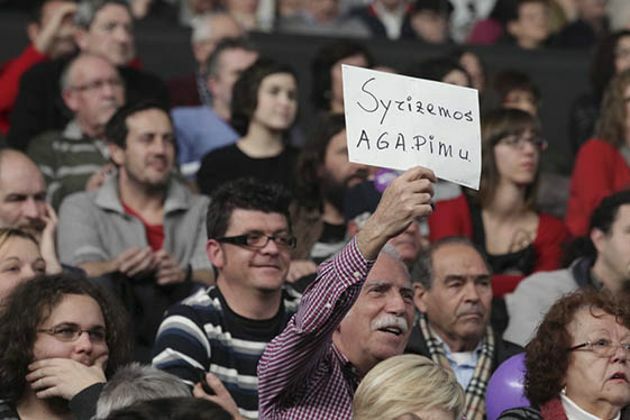 That serious threat to traditional parties in Spain is Podemos (‘We Can’, in English). Hence, the Spanish Prime Minister, the conservative Mariano Rajoy, paid a rare visit before the elections to his then Greek counterpart, Antonis Samaras –the only head of a European government who did it – heralding his support and denying that a victory of SYRIZA at the snap polls could provide succour to its Spanish political brother, Podemos. In the year ahead, Spain faces local and regional elections in May and a national vote in November. In between, Catalonia holds its election in September. Within ten months, the ruling Popular Party (PP) could find its overwhelming dominance over Spanish institutions undone and the mainstream parties might see their share of the parliament diminished to a record low. Instead, Podemos is poised to have the key not only in the national parliament but also in several regional chambers. The latest polls have shown it as the leading force in Spain or, in the most pessimistic scenario, as the third one, neck-and-neck with the PP and the Socialists. Within one and a half years from its creation, Podemos is performing a meteoric rise without precedent in the country’s recent history. That march helped to calibrate the scale of the popular support Podemos has and to dispute some of the polls’ conclusions. While surveys coincide in portraying the average Podemos supporter aged between 18 and 30 years old, whereas most of those who attended the march had grey hair. Many Republican flags, mostly linked to left or far-left voters, fluttered straight over their heads –something that widely explains why Podemos has as many convinced supporters as convinced naysayers. Walking along the same path? More parallels could crystallise within the political landscape. The Socialists are bearing the full brunt of Podemos’ rise, failing to stop the haemorrhaging of voters to other left-winger forces and the party led by Pablo Iglesias. Ciudadanos (Citizens, in English), a liberal and social democrat party that has recently come to the national political fore from Catalonia, is taking up the slack of discontent among conservative voters of the PP. The ruling party is the only one that withstands the vertiginous upsurge of Podemos despite being embroiled in dozens of corruption scandals in which mayors, regional officials and high-ranking party members are implicated. However, the economic scenario is far from similar. Growth accelerated last year to 2 percent (as much as Germany) and, even though it has entered an electoral year, Spain is expected to grow by 2.4% in 2015. Renascent domestic demand is one of the key invigorating elements. Notwithstanding that the unemployment rate is stalled above 20 percent, Spanish officials trust that it will end below that mark this year. Debt is another of the remaining shadows to these flattering trends, heading to 100 percent of GDP and with little perspective of ebbing in the medium-term. Despite diverging realities, the political game is being played out on the same pitch as Greece. While Rajoy and his party brandish the economic recovery and political stability as their trump card, Podemos stirs the overthrow of the “old regime” and the launching of an economic revolution, in which a debt restructuring resounds above all. Although Greece’s developments are barely felt in Spain via the markets, the breeding ground that is bolstering forces like Podemos is quite the same. An astonishing 27 percent of Spaniards – or 13 million people – hovers around the poverty threshold, a recent report from the European Anti-Poverty Network found. More than half of the Spanish youngsters are unemployed, just behind Greece’s rate. And, more importantly, it is Podemos’ discourse of bringing back dignity, fighting corruption and stemming the so-called “austericide” that woos so many disenchanted, worn-out voters of the traditional parties. The jitters in Europe continue to intensify ahead of the electoral year in Spain –especially after SYRIZA’s victory. The Eurogroup’s summits have meant the staging of that nervousness. “Rajoy was nervous,” the Greek prime minister, Alexis Tsipras, said in the first meeting after the elections. “He shouldn’t bring his domestic problems here. That’s a wrong approach. The internal problems should be resolved in Spain with policies accepted by the Spanish people,” he added. The Spanish aversion to further ease Greece’s bailout conditions made a new agreement even dearer to the Greeks at the last Eurogroup meeting. Spain’s finance minister, Luis de Guindos, reportedly shouted at his Greek colleague, Yanis Varoufakis, and displayed in the negotiations a more hawkish stance than Germany’s Wolfgang Schäuble. The Spanish government knows what it is at stake. Unless polls and popular mood improve, the ascent of the “Spanish SYRIZA” will trigger a U-turn not only in Spain’s politics but also in the European Union’s at a critical time: when the eurozone struggles to get back on to the growth track - with Spain as one of the few slivers of hope - and Greece is testing the foundations of the European project. >"The triumph of SYRIZA may unleash a political domino effect in Europe." Imho probability is 1%, unless you also count success of Marie LePen etc. as such domino effect.